Breathable GORE-TEX® fabric is supplemented with Kevlar® patches on arms and legs that protect against abrasion damage from fast roping. Cushioned patches on the knees and elbows add additional protection during tactical maneuvers while the integral neck pad reduces chafing and discomfort caused by tactical vests or harnesses worn during operations. An internal suspender system creates a more custom fit and reduces bulk. 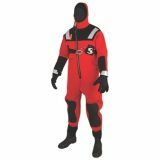 Mustang's patented Closed Comfort System (CCS™) adjustable neck seal can be worn loose to provide comfort out of the water and can quickly be drawn tight to keep the water out. Trim to fit neoprene wrist seals provide a comfortable, functional alternative to traditional latex seals. A diagonal waterproof entry zipper and horizontal waterproof relief zipper ensure easy entry and crew comfort during extended operations. 110' Pet Rescue Line Bag w/Lasso - Bag and Rope for use with the Marsars Reach Pole and Shepherd's Crook attachment. Allows rescuer to remain a safe distance from animal while being able to place a lasso over head of animal for safer retrival. Contact us to receive a photo via e-mail. Photo coming soon.